The Avenger -- "The Cradle of Doom"
The Avenger (1941-42, 1945-46) aired "The Cradle of Doom" on October 26, 1945. I have run only two previous episodes of The Avenger, the last being in June of 2018. 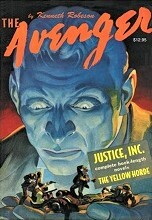 For those coming to this program for the first time, I reprise my introduction to the previous two episodes, both beginning with the fact that The Avenger radio program was a spinoff of magazine publisher Street & Smith's The Avenger magazine which ran from 1939-1942 (cover at left, July 1940 issue) and whose adventures were written by Paul Ernst (Street & Smith being the original publisher of Astounding Science Fiction, and for many decades the largest magazine publisher in the world). The Avenger on radio was short-lived (at least in its 1945-46 incarnation), lasting only twenty-six episodes. Many of the shows were written by Walter Gibson (1897-1985, pictured at right--who wrote The Shadow magazine novels under the house name of Maxwell Grant) and starred James Monks as Jim (the Avenger) Brandon. Truth be told, the Avenger was a cross between Doc Savage and the Shadow, with the emphasis placed on the Shadow. The Shadow's primary advantage (aside from his detective abilities and his close circle of confidants and helpers) was his ability "to cloud men's minds" so that they could not see him, and his phantom voice which, in many cases, frightened criminals into their fatal mistakes, or deaths. Doc Savage, on the other hand, was self-schooled in many scientific and physical disciplines, and had no "powers" of any kind. Jim Brandon, as the Avenger, combined both. He was a biochemist who, through years of scientific experimentation, perfected two inventions to help him fight crime: a "telepathic indicator," which allowed him to pick up random thought flashes, and a secret "diffusion capsule" which cloaked him in the "black light of invisibility." Thus, the scientific aspect of his persona reflected Doc Savage, where his "black light of invisibility" was a more-than-obvious nod to the Shadow. While the Shadow on radio (as opposed to his original magazine persona) had Margot Lane as a companion, partner, and love interest, so did the Avenger have his "beautiful assistant Fern Collier." Doc Savage and The Shadow were immensely popular in their magazine formats, as was The Shadow subsequently on radio, which ran from 1937 through 1954. The Avenger-on-radio's first episode (again of its second iteration) was in June of 1945--eight years into The Shadow radio program, and nine years before its demise in 1954--smack dab in the middle of one of the most popular genre radio shows in history, with said magazine's history going all the way back to 1931. Gibson's (or Street & Smith's) attempt to create an alternate character combining the best aspects of both Doc and the Shadow--while a terrific idea on paper--didn't work quite as hoped. While many of The Avenger episodes followed the formula of The Shadow episodes with minor variations (noting that Fern Collier was a terrific companion to Jim Brandon, and also knew his secret identity as did Margot Lane in the radio version of The Shadow), somehow the show never quite caught on as planned. Roughly 1/4 the Shadow and 3/4 Doc Savage in makeup, radio historian John Dunning wrote (in his 1998 book, (On the Air: The Encyclopedia of Old-Time Radio, Oxford University Press) that these 1945 shows were "a poor man's version of The Shadow." And, to be honest, that is a fair assessment. That said, and with many of The Avenger's storylines and plots (traditional crime-related villainy centering on murder, fraud, theft, crime-rings, rogues, and even eccentric, exotic villains, etc.) virtually interchangeable with those of The Shadow (remember that they were written by the very same Walter Gibson, while he was still writing for The Shadow magazine--two pounded-out, first-draft novels per month! 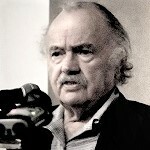 ), perhaps it was the lack of the expected and familiar eeriness longtime readers and listeners had come to enjoy and expect from The Shadow radio programs, against the more straightforward, no-nonsense delivery and general tone of The Avenger episodes, that led listeners to somehow feel that Avenger stories failed to distinguish themselves enough from The Shadow for its further continuation. In other words, while well enough done and perfectly acceptable for the most part for its intended young audience, why listen to Shadow-lite when the original was available? However, The Avenger has proved popular enough through the intervening years that his adventures have appeared in comic books, a series of original novels (of interest to science-fiction fans is that SF author Ron Goulart [1933- , photo at right] writing under the name of Kenneth Robeson--Robeson being the house name for the Doc Savage novels} wrote twelve Avenger novels in the 1970s, and among his other credits ghostwrote the TekWar novels by William Shatner), and in 2009 Anthony Tollin's Sanctum Productions began reprinting near perfect facsimiles of the original The Avenger magazine, featuring two complete novels with the original illustrations, original covers, and several new features (usually historical, and fascinating in nature) added to each reproduction. They are in the same trade paperback format as Tollin's beautifully reproduced The Shadow and Doc Savage facsimiles (I own several), and can recommend them without reservation for pulp magazine lovers of these (and other) heroes of the pulp era. As with many Golden Age radio shows, information is lost, inconclusive, inconsistent, or downright conflicting, depending on which historical venue one visits for research. In the case of The Avenger, some sites have the original show as running from either 1941-42 or 1941-43, and with up to over 100 shows (now all missing/lost, alas, which fact seems to be accurate). Of the second series, the 1945-46 iteration, there seems to be a consensus that there were but 26 half-hour shows (or were there 52?). One site lists 26 shows for the 1945 season but has no titles, and with 26 shows with air dates and titles for the 1946 season. Then there is yet another site with a complete listing (air dates and titles) of 26 episodes for the 1945 season, but which, aside from different air dates, are aired in the same order but on different dates for the 1946 season as given from one of the sites mentioned above. The air date I have decided to go with is from the Old Time Radio Researchers Library, which lists all 26 of the remaining episodes with air dates and titles from the 1945 season. As for "The Cradle of Doom," the Avenger gets involved when he is asked to investigate why a sane man has been more or less railroaded into a sanitarium for the mentally ill. We soon discover a scientist performing an ongoing series of illicit experiments for what he believes will be for the future good of humanity's mental health if his experiments prove correct. There's a large old mansion with a tower, patients living behind locked doors, a locked basement where all the good stuff happens, and some death and mayhem tossed in for good measure. And it doesn't hurt any that two of the lead characters speak with thick Eastern European accents reminiscent of Bela Lugosi's homeland of Hungary. So sit back, get ready for some fun, and enjoy the Walter Gibson tale he called "The Cradle of Doom."